In this epic saga of magic and kungfu, four siblings battle rival clans for honor and power in an Asia-inspired fantasy metropolis. Jade is the lifeblood of the island of Kekon. It has been mined, traded, stolen, and killed for -- and for centuries, honorable Green Bone warriors like the Kaul family have used it to enhance their magical abilities and defend the island from foreign invasion. Now, the war is over and a new generation of Kauls vies for control of Kekon's bustling capital city. They care about nothing but protecting their own, cornering the jade market, and defending the districts under their protection. Ancient tradition has little place in this rapidly changing nation. When a powerful new drug emerges that lets anyone -- even foreigners -- wield jade, the simmering tension between the Kauls and the rival Ayt family erupts into open violence. The outcome of this clan war will determine the fate of all Green Bones -- from their grandest patriarch to the lowliest motorcycle runner on the streets -- and of Kekon itself. Jade City is the first novel in an epic trilogy about family, honor, and those who live and die by the ancient laws of blood and jade. 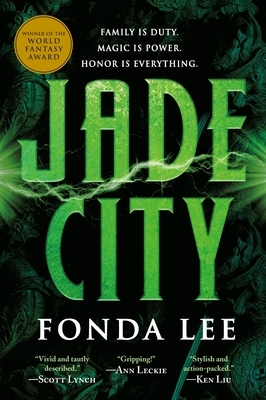 Fonda Lee is the Nebula, Locus, and World Fantasy Award nominated author of Jade City and the award-winning author of the YA science fiction novels Zeroboxer and Exo. Born and raised in Canada, Lee is a black belt martial artist, a former corporate strategist, and action movie aficionado who now lives in Portland, Oregon with her family. Jade City, a finalist for the 2017 Nebula Award for Best Novel, is her adult debut.